Will Gowers in action for the Sydney Swans Academy. 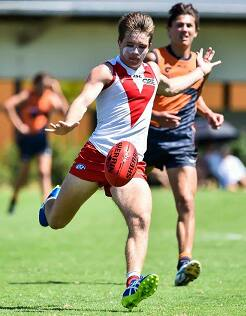 Sydney Swans Academy member Will Gowers has earned the Round 5 NEAFL Rising Star nomination following his eye-catching performance against NT Thunder in Darwin on Friday night. The 19-year-old midfielder collected the equal highest possessions (28) for the game, together with seven inside 50s and a goal, as the Swans won a historic first ever match in Darwin by 24 points. An inaugural member of the Swans Academy – joining the club when he was just 11 – Gowers missed out on NSW/ACT Rams selection last year for the National Under-18 Championships. But the Swans offered the Glebe Greyhounds junior the opportunity to join their Under-19 Academy squad this year to further develop at NEAFL level. Gowers hasn’t missed a match so far, averaging 20 disposals, and said he is relishing the chance to continue playing with the club. “I’ve always been a late developer, so when I didn’t get picked (for NSW/ACT Rams) I knew I had the club’s support to give me another year to see what I can do,” he said. Nominees must be under the age of 21 and played less than 20 senior games (excluding games as AFL top-up players) at the start of the 2017 season.